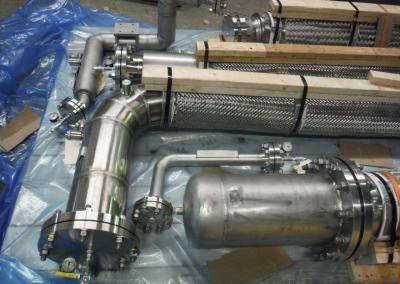 AET Designs and Manufactures vacuum jacketed transfer lines for the cryogenic industry. This application is utilized to transfer gases/liquids with a low boiling point while shielding them from atmospheric interference. 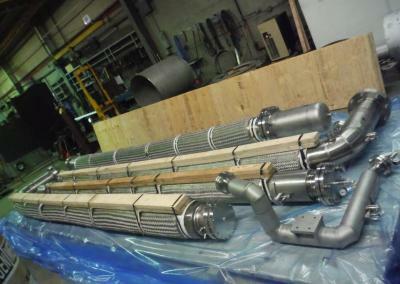 These piping assemblies can also include Flex Segments to help with customer connection point alignment. 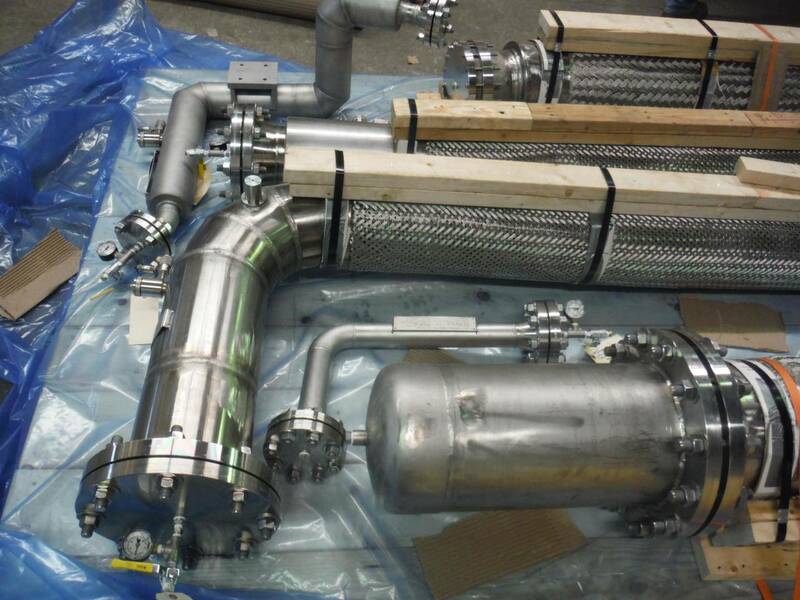 Transferring cryogenic liquid without vacuum jacketing can cost a large amount of money due to heat leaks. Keeping waste costs down can mean more funding for other parts of your project, or in some cases, more end product to sell to your end user. For more information on vacuum jacketed lines, see the tabs below. Large diameter vacuum hoses have their own set of manufacturing considerations. Due to the size and use cases requiring these sizes, dye penetrant testing and radiograph examination is often required. AET also performs additional calculations for criteria such as contraction/expansion, heat leak, pressure, and spacer functionality. Sizes Available: 6″ to 24″ Inner Pipe Size. Larger sizes may be possible given design considerations. Please contact us for more information. 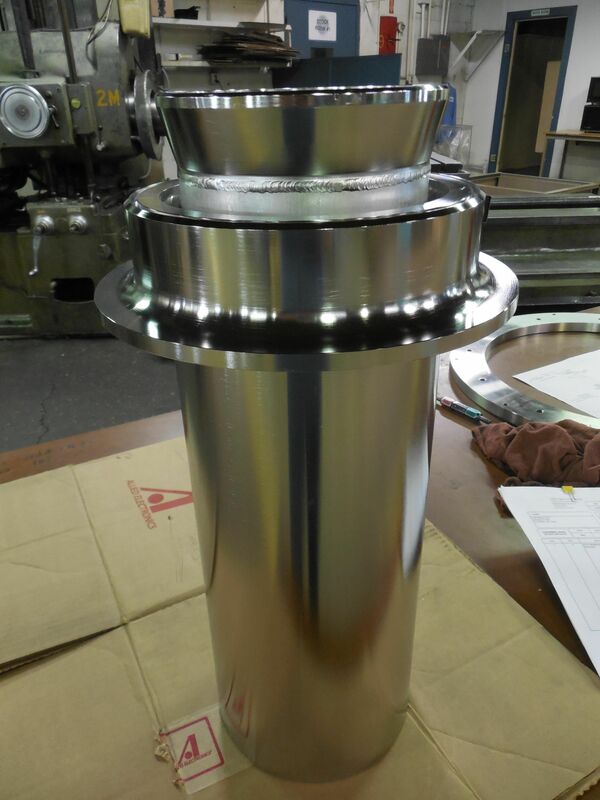 In addition to vacuum jacketed piping, we can provide our own large bayonet couplings up to 24″ inner pipe diameter. These bayonets are cold shock tested and designed for superior functionality with a simple flange-based connection for easy install. 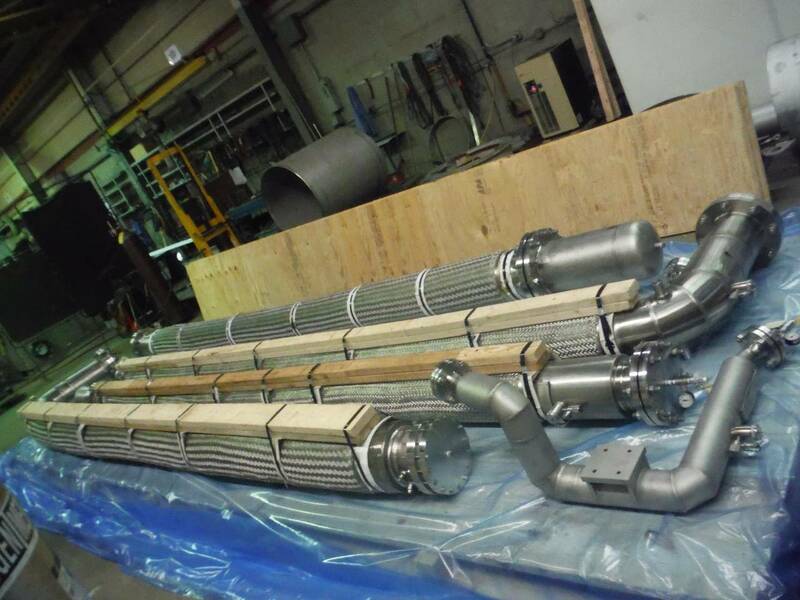 In the above video, a selection of vacuum insulated (jacketed) hose fabricated by AET can be seen starting at 0:34. 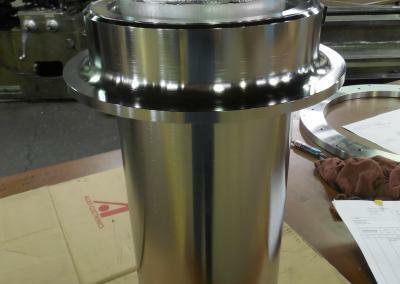 In the below video, cold shock testing of a large bore bayonet is displayed. Vacuum Jacketed Pipe (AKA Vacuum Insulated Pipe or Cryogenic Piping) is utilized in systems that require the transfer of low boiling point liquids from point “A” to “B”. 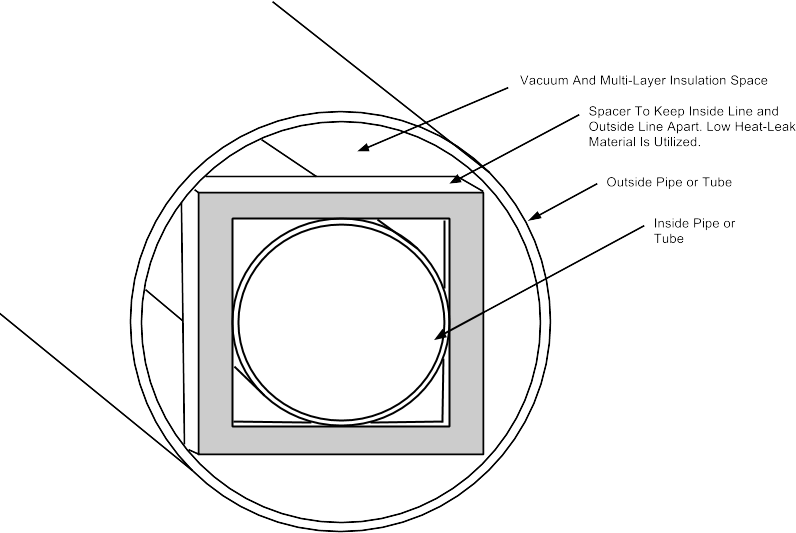 The diagram below is a typical example of a cut-through vacuum jacketed pipe segment. The inner pipe or tube contains the process medium and is insulated with multiple layers of mylar-based insulation. There are low-heat leak spacers placed between the inner and outer tubes to keep them separated to avoid heat leaks via metal to metal transfer. The outer pipe would be fit with a pumpout port to remove air from the anular space and thus create a vacuum insulating area. 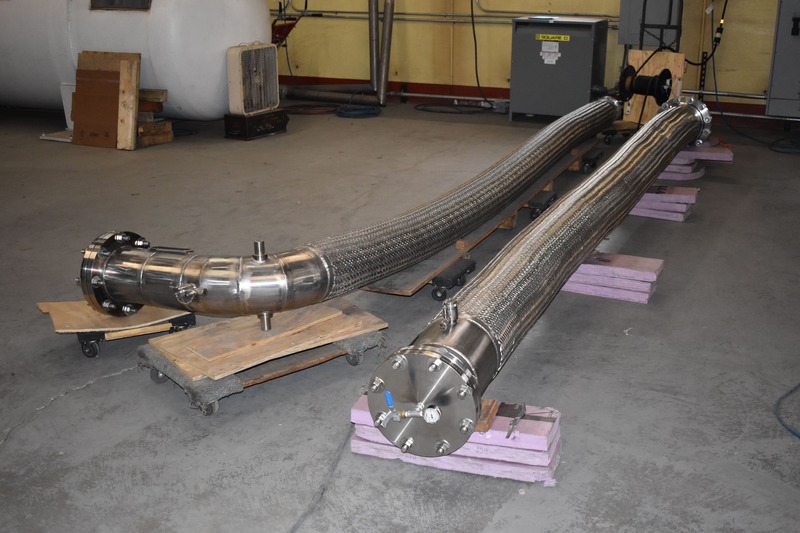 Below is a list of tools and resources related to vacuum jacketed lines. Cryogenic Society of America is a not-for-profit organization that provides information and resources for all things in the Cryogenic industry, as well as organizing their quarterly issue of “Cold Facts” magazine to those interested. ASME B31.3 is a guideline for piping safety and has been adopted into many vacuum jacketed pipeline designs. The guidelines there-in outline many things, but a table of contents page can be seen at the reference link. Although we offer a full range of vacuum jacketed line assemblies and components designed and manufactured by AET, we can also incorporate third party components to mate with an existing system, i.e. Bayonets and Pumpouts.